We are all about producing the finest reproductions of the frosted duco finish found on vintage National guitars. Frosted duco was a popular novelty finish in the 1930s. It is lacquer containing a crystalline material that creates a frost-like pattern in the dry paint. Because of the nature of how crystals grow, no two results are ever alike (very cool and also very frustrating at times) and as a result, each guitar unique. National used the frosted duco finish from 1931 to around 1937. Here at B•FanaticGuitarworks, we have worked tirelessly to replicate the finish used by National and as a result, frosted duco is now available again on new guitars manufactured by National Resophonic, as their Dueco Model. It is also available for restoration of your old National that has lost its original finish. In the mid 1930s National’s sister company, Dobro, also made metal-body guitars, (A.K.A. fiddle-edge, which refers to how the body was constructed), finish in frosted duco. Most commonly in gold, but also in silver with a gold burst. I have also seen a handful of 30′s era, wooden parlor style guitars with a frosted duco style finish. So that is what the finish is all about. Here’s my story: I started working on this science project in 2004, (I’ve missed lots of dinners at home with my family as a result). It all began with a totally stripped National that I purchased with the intention of putting the frosted duco finish on, (easier said, than done). Little did I know that along with testing the finish on numerous other guitars, I would end up painting that first guitar at least 30 times over a five year period before I got it right (the yellow National Collegian on this site). It’s safe to say that I have applied this finish hundreds of times and after much trial and error, and tons of research, I’m finally able to produce the fine finish you’ll see on the guitars posted here. My goal has always been to get as close to the look of the original finish, that modern materials would allow. The Vintage Burst finish currently found on National Reso-phonic’s Dueco Model is a very close replication of the original green frosted duco found on 30’s Duolians. 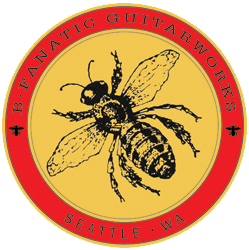 So here’s B•FanaticGuitarwork’s story: At B•FanaticGuitarworks you can find, restored guitars, a source for restoration for that trashed but cool National or Dobro you own, and new guitars made by National Resophonic, (with a B•FanaticGuitarworks finish lovingly applied). We are proud of our association with National Resophonic and currently do the finish on all of their Dueco Models. So, go out and buy a guitar, visit us regularly, and thanks again for checking out B•FanaticGuitarworks.